All plants, including tomatoes, are affected by growing conditions, by the care they receive, and by their basic physical makeup. Unlike diseases, insects, and other biotic (living) pests, abiotic problems (environmental, cultural and physiological problems) cannot be spread from plant to plant but can affect other plants sharing the same situation. Adverse growing conditions can sometimes be controlled and reversed by human intervention, for example, by watering during times of drought, by improving poor soils, by mulching to provide even soil moisture, or by selecting a cultivar more tolerant of adverse growing conditions. But sometimes there is no cure for a problem and gardeners must simply suffer the consequences. 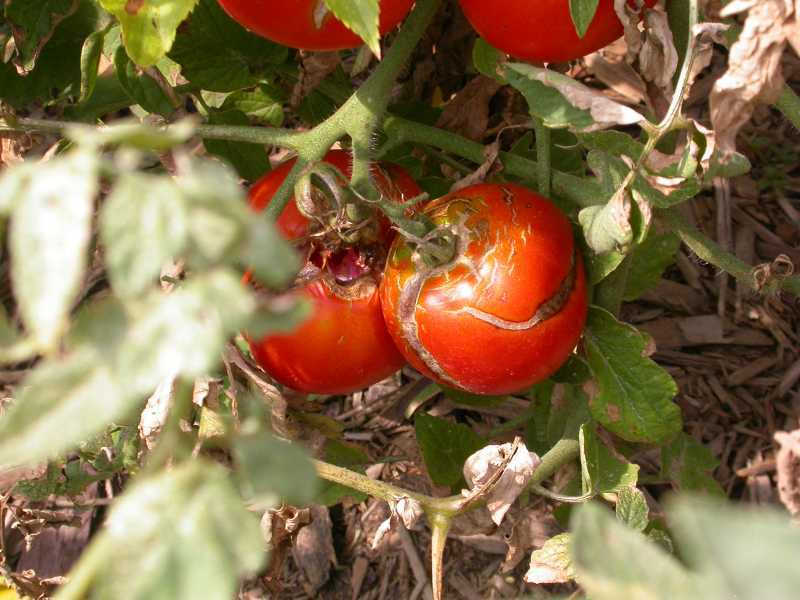 Listed here are some common abiotic problems that affect tomatoes. Included are their causes and cures (if any). Because the following problems are NOT caused by a living organism, insecticidal and fungicidal sprays are NOT effective in controlling these problems. Select varieties that are less prone to the problems common in your area. Your state Extension Service will have lists of recommended varieties for your area. For guidance on providing tomatoes with the growing conditions that they prefer see, Kemper Factsheet: Tomatoes and for an overall guide that includes disease, insect, environmental and other problems that afflict tomatoes, see these two visual guides: Tomato Fruit Problems and Tomato Foliage Problems. 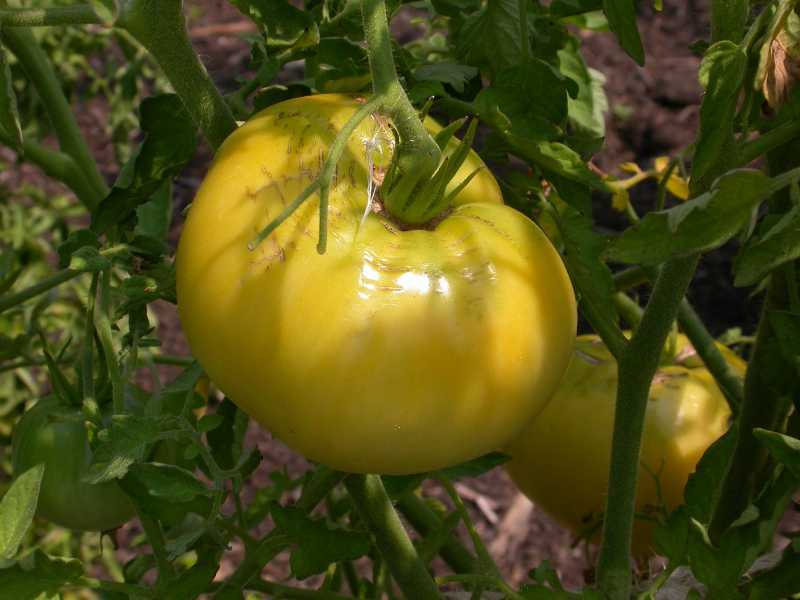 Tomatoes cannot be grown within 50 feet of the drip line of a black walnut or butternut tree. The roots of these trees produce a chemical called juglone which is very toxic to certain other plants including all solanaceous crops (tomatoes, peppers, eggplants, potatoes). Most of the toxicity is limited to within the drip line of the tree, but the area of toxicity typically increases outward as the tree matures. For more information, see FAQ "What can I grow under a black walnut tree?" 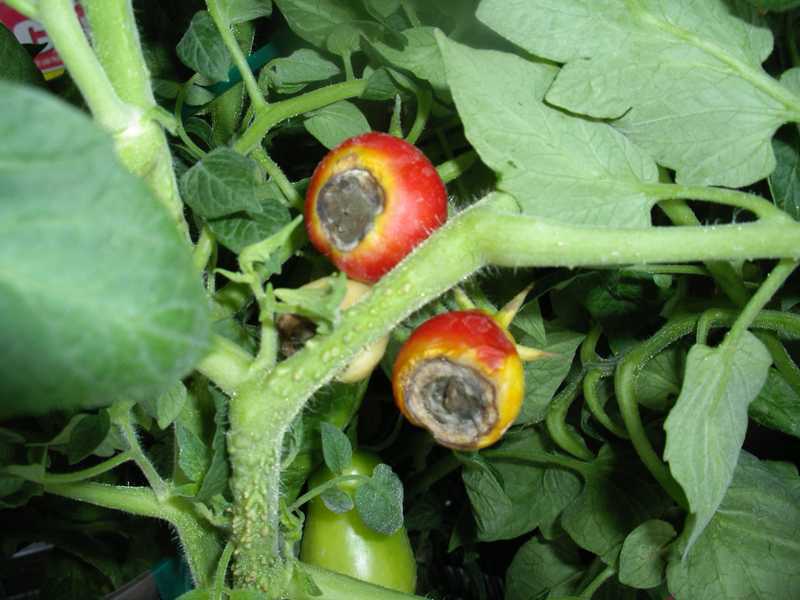 Blossom end rot is caused by a calcium deficiency during fruit development. 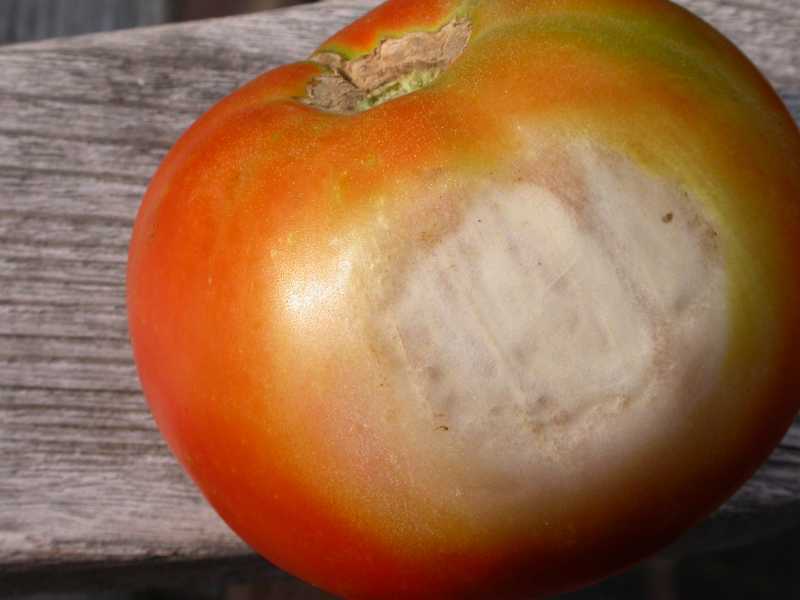 Although most soils in the St. Louis area contain plenty of calcium, St. Louis gardeners are still plagued by blossom end rot. This seeming paradox has its roots in the way tomatoes absorb calcium from the soil as calcium is taken up with water. So, one obvious culprit is uneven soil moisture during fruit development, but there are others. 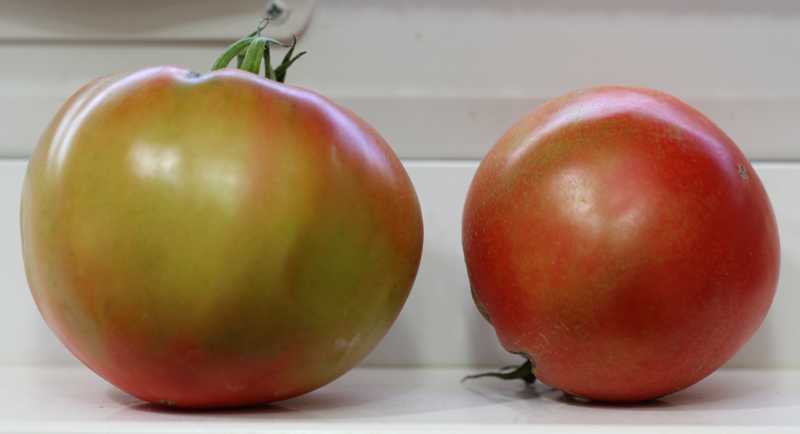 Some tomato varieties, especially Roma type tomatoes, are more prone to blossom end rot than others. 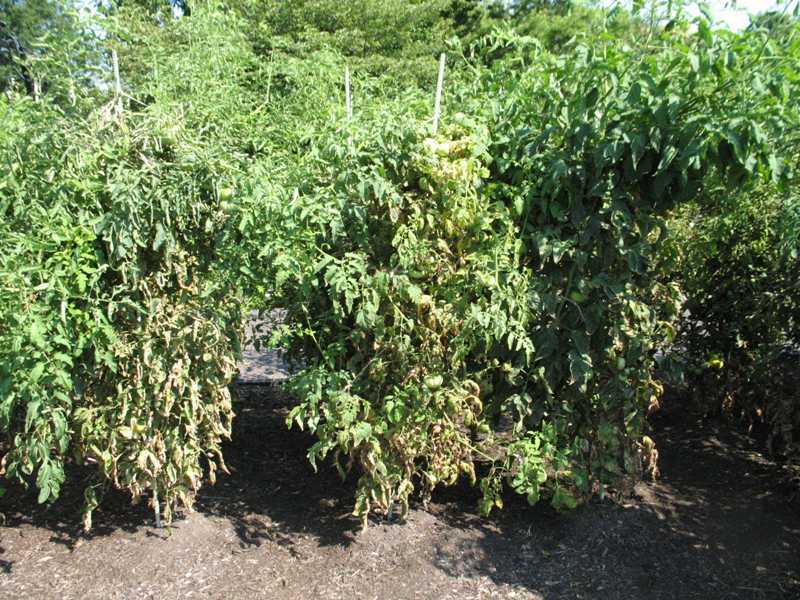 For more possible causes and for control strategies, see: Blossom End Rot of Tomato and Pepper. 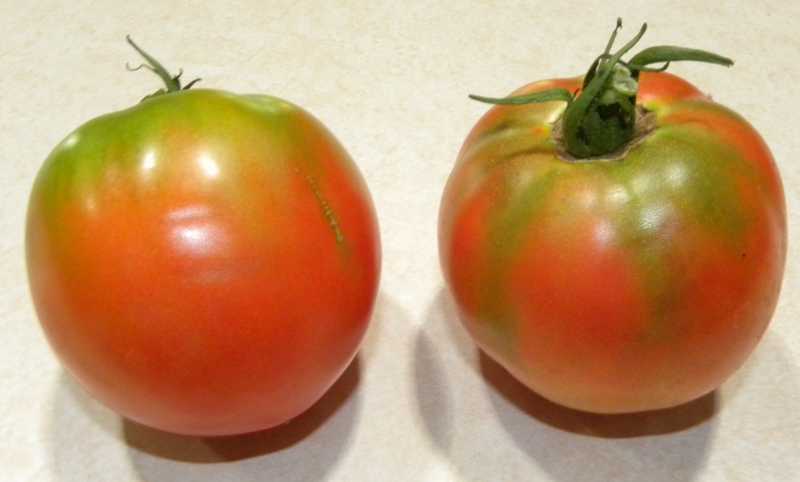 Blotchy ripening is when fruit ripens unevenly and the normal red pigment is absent from localized areas. This disorder may appear as yellow to gray-green patches on the fruit. When sliced open a brown discoloration may be apparent. Cultural, weather and nutritional problems may contribute to the condition. Associated with this problem are low potassium levels in the soil, cloudy periods and inadequate light intensities. Other possible contributing factors are high soil moisture, high humidity, low temperature and soil compaction as well as excessive fertilization. All of these factors may promote a nutrient imbalance, which results in abnormal pigment formation. Provide balanced fertility and good cultural conditions to maintain plant vigor. For control measures, see: Integrated Pest Management Strategies 1, 2, 3, 4 and 7 listed below. 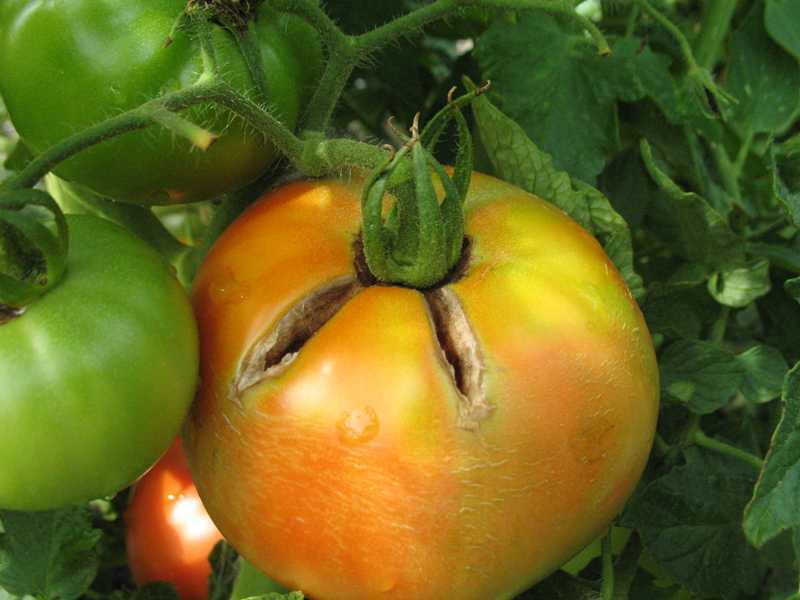 Catfacing is a condition involving malformation and scarring at the blossom end of tomato fruits. 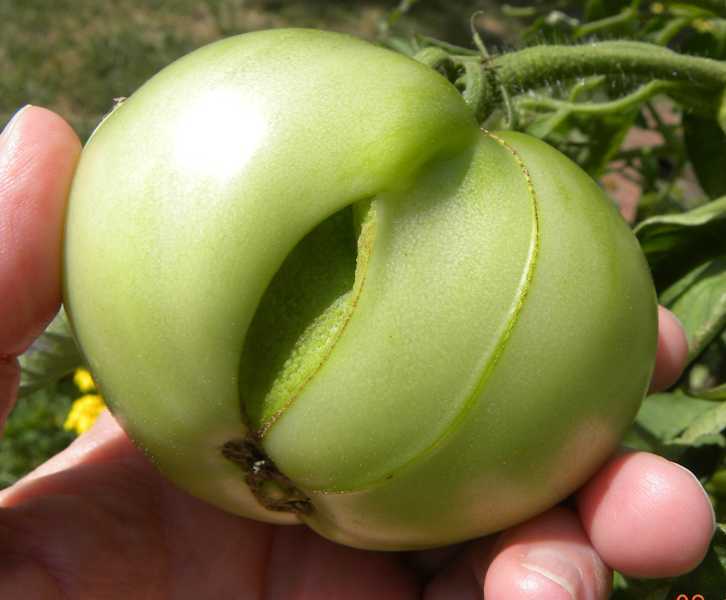 On some tomatoes, holes develop that can extend deep into the flesh. The cause is uncertain, but it's thought to be caused by an injury during flower formation. 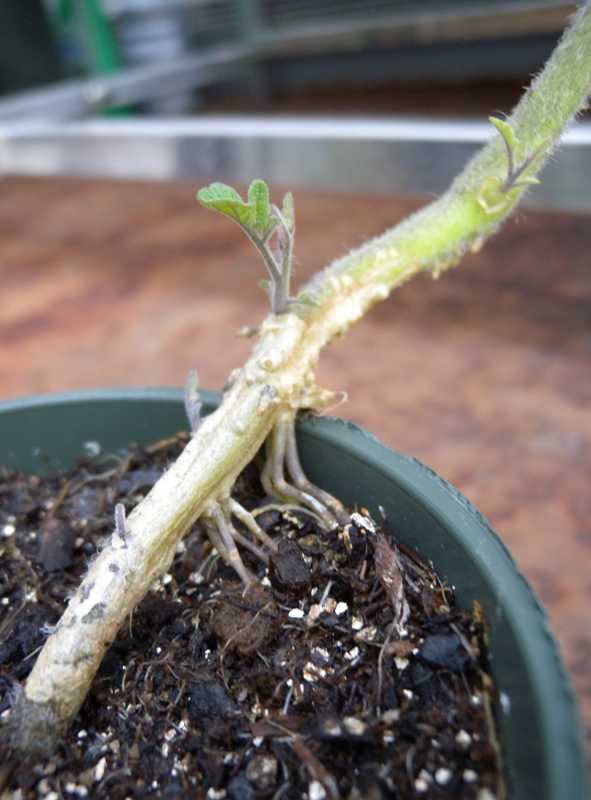 The injury could be from exposure to cold temperatures, the application of high nitrogen fertilizers, exposure to some herbicides (for example, 2,4-D), or improper pruning of indeterminate varieties that reduces auxins. Large-fruited tomatoes are more susceptible to catfacing than small-fruited tomatoes, but some varieties are particularly prone to catfacing and should be avoided if catfacing has been a problem in the past. For control measures, see: Integrated Pest Management Strategies 1, 3, 5, 7 and 8 listed below. A tomato transplant (Lycopersicon) set out too early and caught by a late freeze. 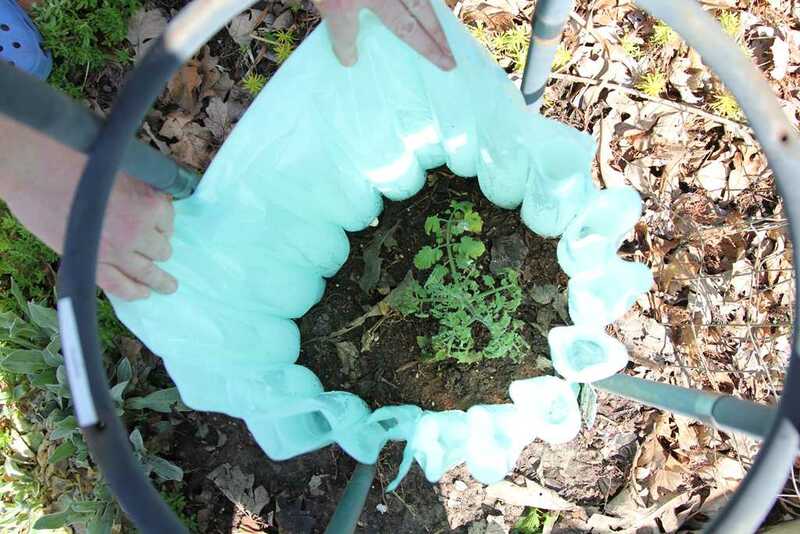 Frost protection for tomatoes (Lycopersicon). This length of plastic has open pockets that are filled with water and warmed by the sun. A tomato plant (Lycopersicon) growing inside plastic cells filled with water and warmed by the sun. 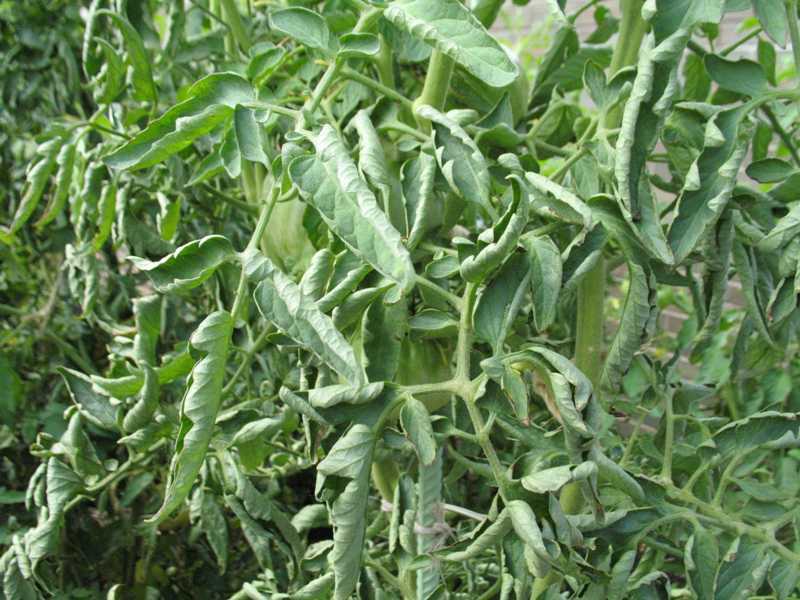 Tomatoes do not like cold soil or cold air temperatures. Setting plants out before the soil has warmed can dwarf plants for the entire growing season and setting them out while frost is still possible can mean plant death. 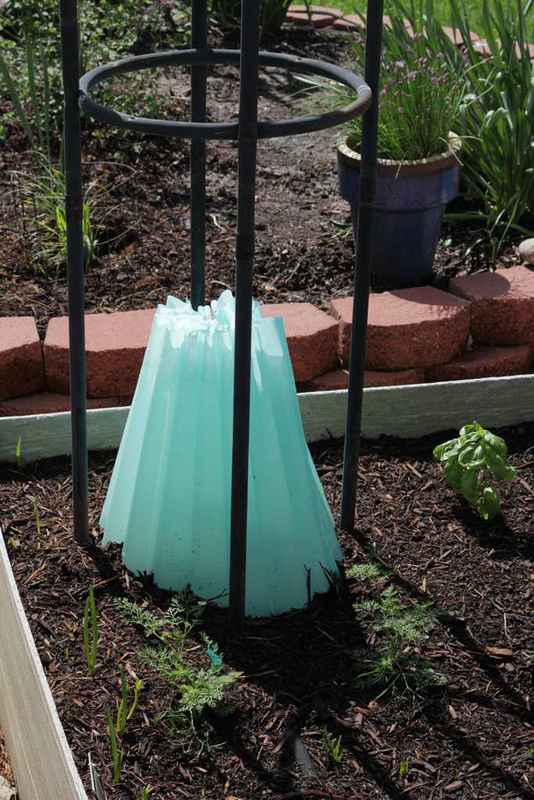 Solution: Do not set out plants until after Mother's Day or use a protective device, such as, a water filled teepee after first warming the soil with black plastic for several days. For possible control measures, see: Integrated Pest Management Strategies 1, 2, 4 and 7 listed below. 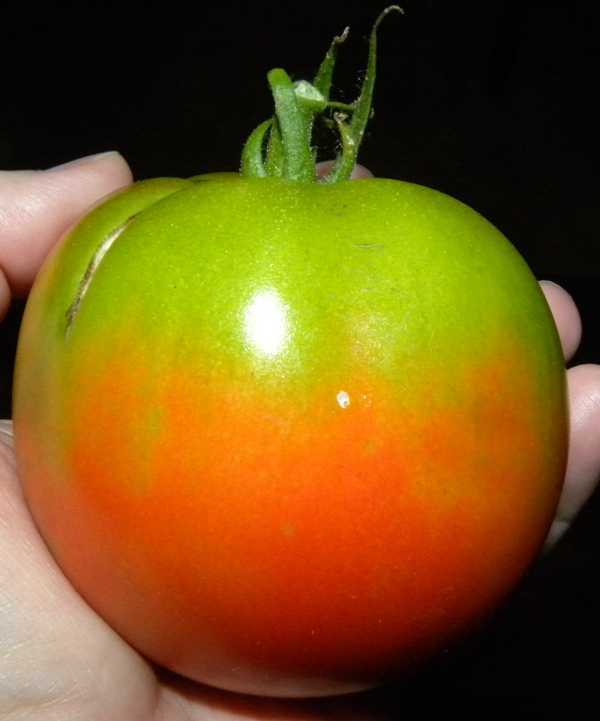 Tomato (Lycopersicon) that has failed to produce any fruit. Temperature extremes, excess nitrogen fertilizer and dry soil are the main causes for lack of fruit set or fruit drop. For tomatoes, daytime temperatures between 70 - 80 degrees F. and night temperatures between 60 and 70 degrees F are ideal. Temperatures below 50 degrees F. or over 90 degrees F. can prevent pollination from taking place, which results in flower drop. In addition to temperature related causes, dry soil can result in fruit drop and high humidity can create sticky pollen which does not transfer well. Excessive use of nitrogen fertilizer can also result in copious leaf production at the expense of flowering and fruit development. 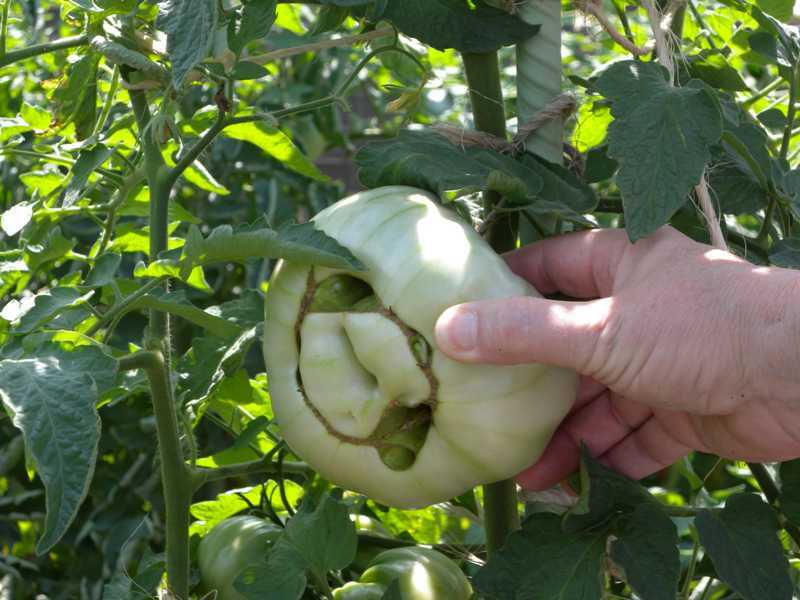 For more information see: Pollination Problems of Tomato and Pepper. Tomatoes that fail to ripen are a huge disappointment and often the cause is beyond human control. 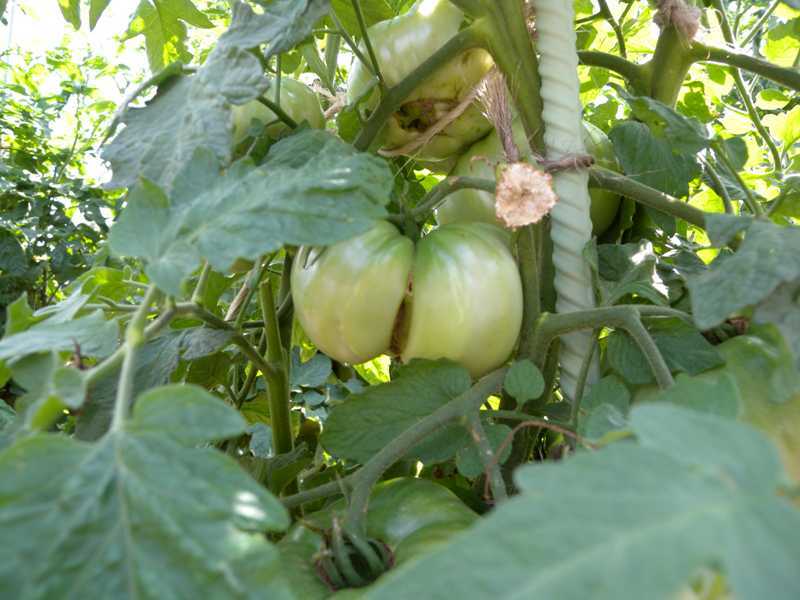 Adverse weather conditions, compacted and overly wet soils, and/or inadequate potassium (potash) can also cause tomatoes to remain green and never ripen. For possible control measures, see: Integrated Pest Management Strategies 1, 2, 4 and 7 listed below. 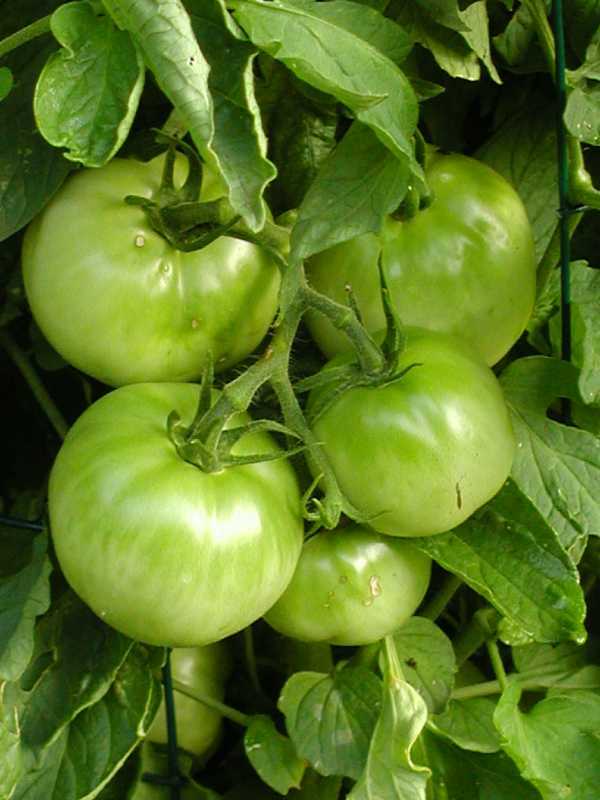 Green shoulders on tomatoes are caused by environmental issues including drought and heat stress. For control measures, see: Integrated Pest Management Strategy 1 listed below. 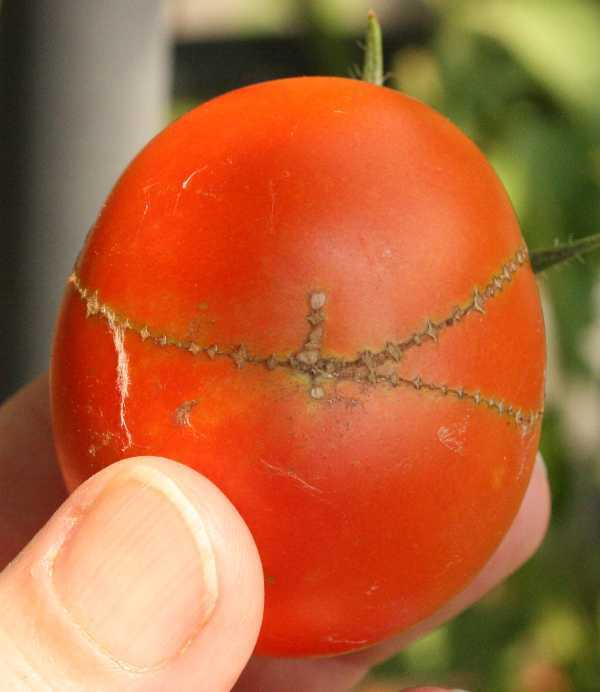 Cracks in the skin of a tomato can be either radial (extending from the stem down the sides of the fruit) or concentric (encircling the fruit). 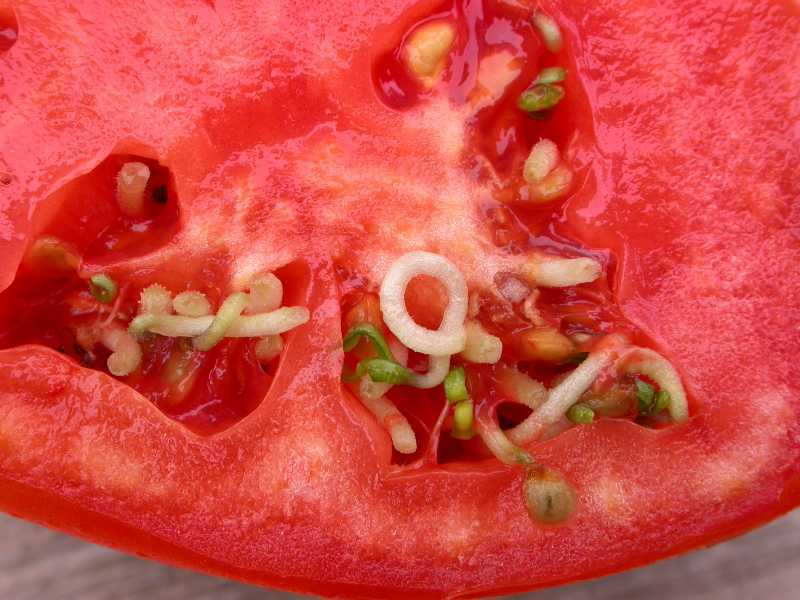 Bursting is usually on the blossom end of the tomato (opposite the stem). All result from the uneven growth rate of the fruit. The most common cause is extreme fluctuations in temperature and/or moisture, usually after a rain that was preceded by a dry period. Cracking or bursting can be caused by over fertilization. 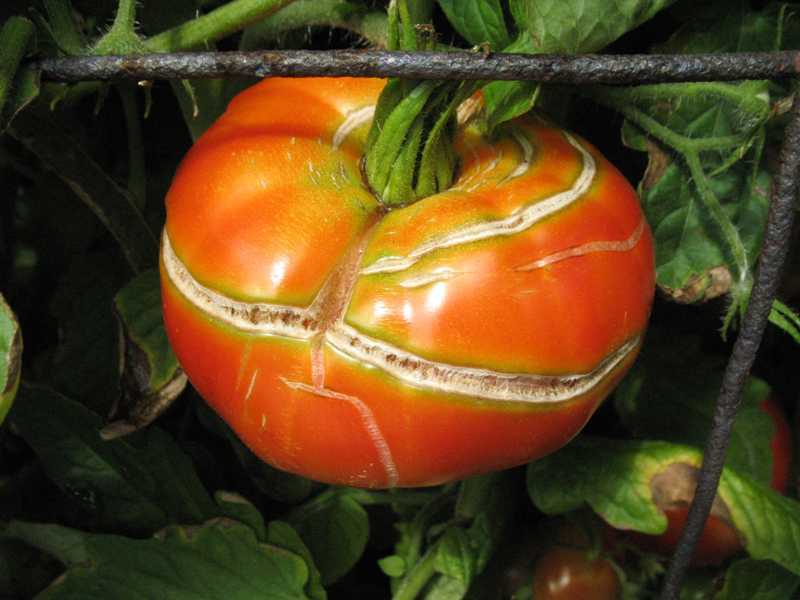 Some tomato varieties are more prone to cracking or bursting than others. For control measures, see: Integrated Pest Management Strategies 1, 4 and 7 listed below. 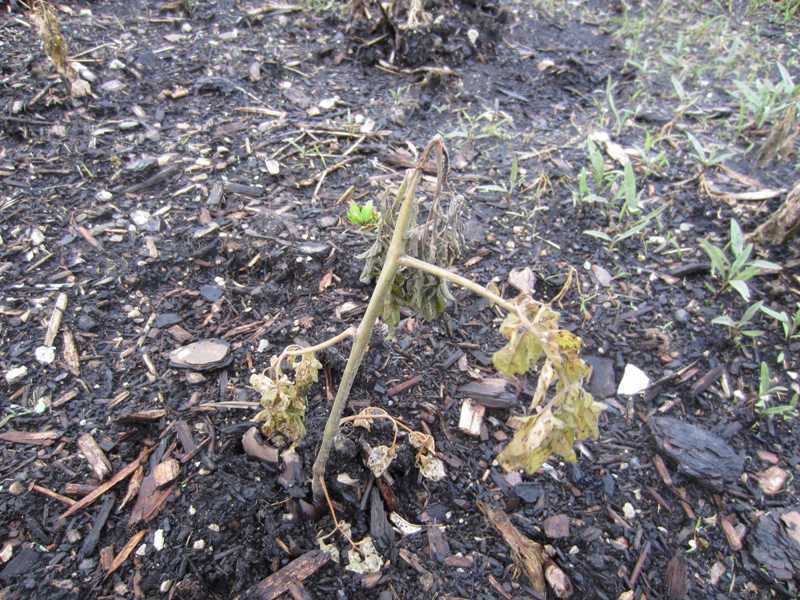 Tomato plants are extremely sensitive to weed killers (herbicides) and usually do not recover. The damage to leaves can reduce plant vigor, stop all fruit production and eventually kill the plant. Different herbicides produce different symptoms, but here are some common symptoms of broadleaf weed killers: older leaves that are distorted, cupped and curled with parallel veins, young leaves that never fully expand and are long and slender with parallel veins; fruit that is misshapen, often catfaced. For more information on herbicide injury see: Herbicide Damage to Plants. Also, see: Integrated Pest Management Strategy 8 listed below. 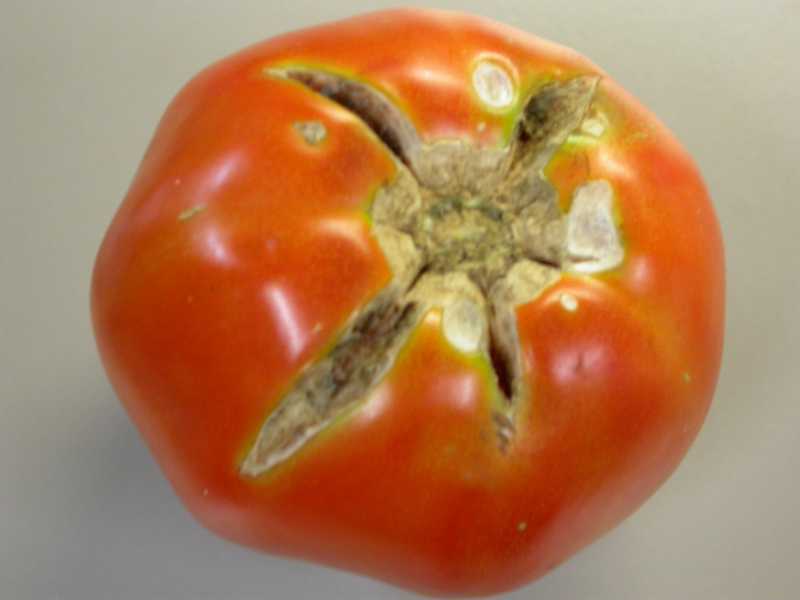 Usually found inside tomatoes with yellow or green shoulders and is caused by environmental issues; such as, drought, heat stress, etc. For control measures, see: Integrated Pest Management Strategy 1 and 5 listed below. 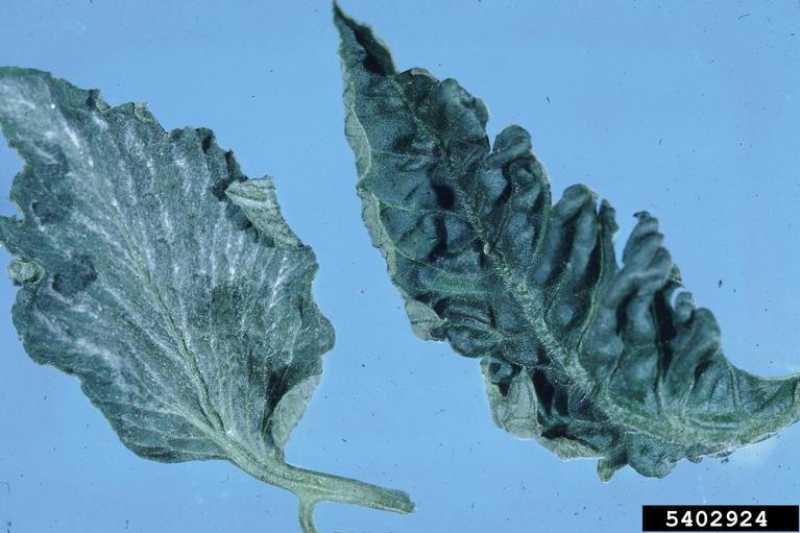 Planting tomatoes too close together encourages foliar diseases and reduces fruit production due to reduced light penetration to lower leaves. Plant tomatoes 3-4' apart in all direction. 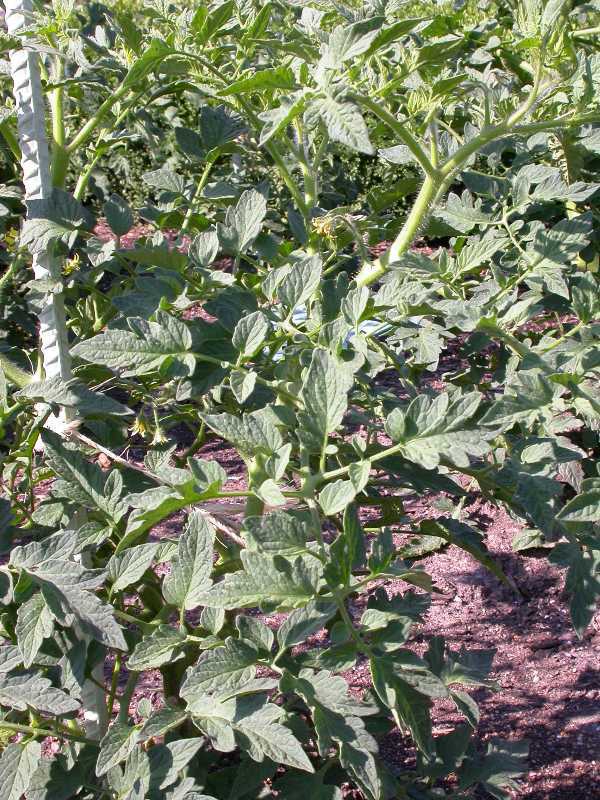 If the leaves on your tomatoes are rolled but have received adequate moisture, the problem could be no problem at all. 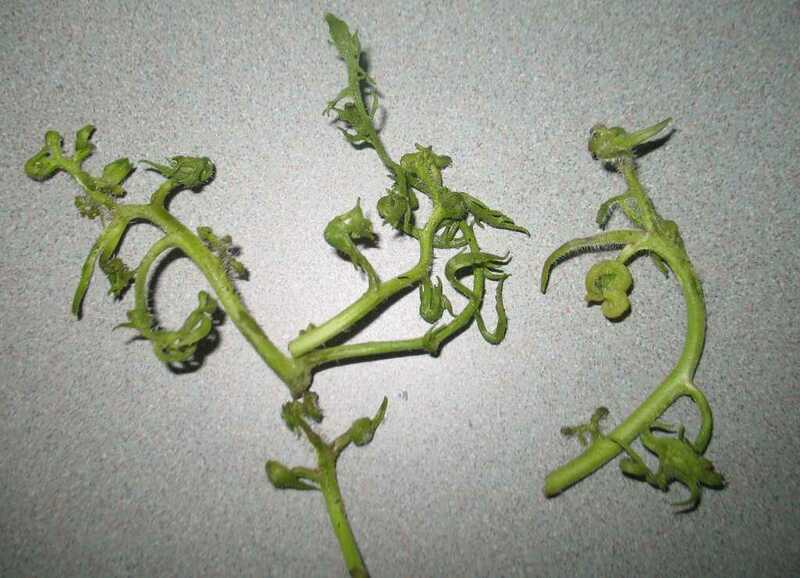 It could be physiological leaf roll which is common and normal on some tomato cultivars. Although it is sometimes associated with hot, dry weather or with other stresses, be aware that if the leaf roll is physiological, it is part of the physical makeup of the plant. No amount of water is going to unroll the leaves and, in fact, too much could damage the roots. For control measures, see: Integrated Pest Management Strategy 1 listed below. 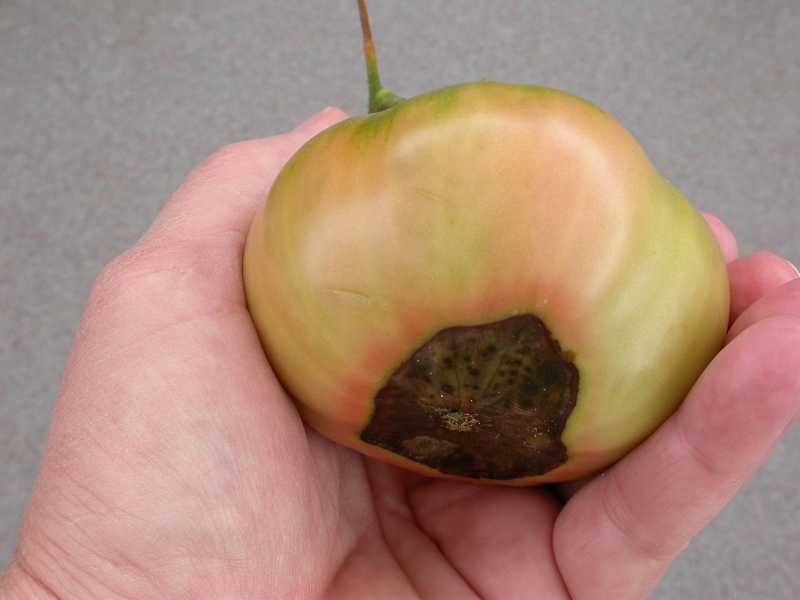 Reduction in tomato foliage can lead to damaging sunlight reaching the surface of the tomato fruit resulting in a whitish spot on the side of the fruit facing the sun with a papery texture. Improve overall plant health and avoid over pruning plants. For more information see: Sunscald of Tomato and Peppers. 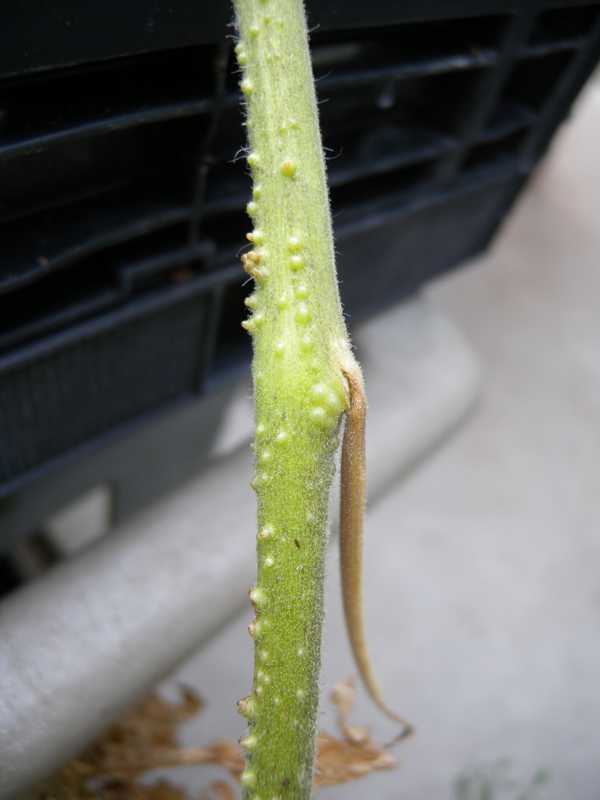 The bumps on this tomato stem (Lycopersicon) are root intiatives. Some of the root iniatives along the stem of this tomato (Lycopersicon) have developed into roots and reached into the potting soil. Tomatoes often root along the stem. This produces small bumps or root initiatives along the stem. This is not a problem. Instead it can be used to enlarge the root system and therefore the potential health of a plant. Dig a short trench for each plant and lay them in the trench on their sides, then cover them with soil. Be sure to mark the buried end to avoid accidentally injuring the plant when cultivating. 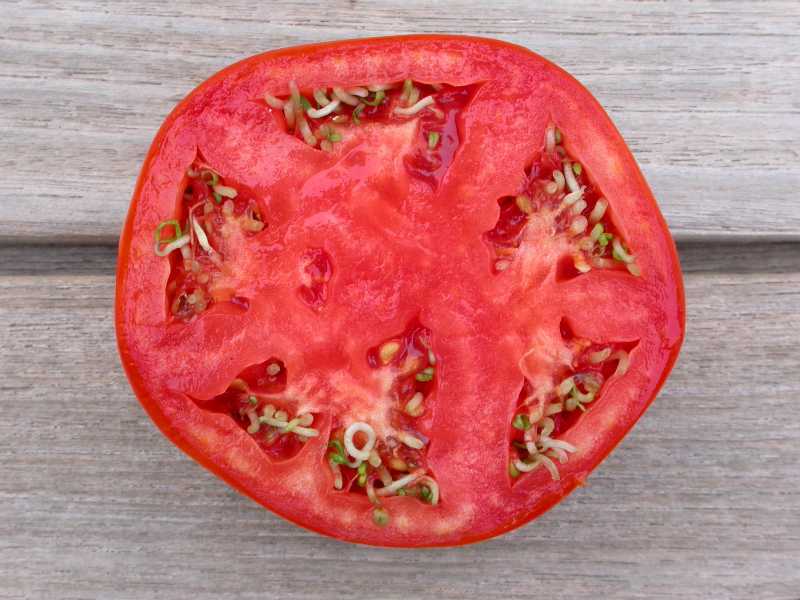 Low acid tomatoes can provide conditions that allow the seeds inside to sprout. To overcome this problem, see: Integrated Pest Management Strategy 1 listed below. Tomatoes prefer soil that is evenly moist all the time. Waterlogged soils cause unhealthy yellowish plants, root rot and eventual death if the situation is prolonged. Dry soils cause poor fruit development, blossom-end rot and eventual death if the situation is prolonged. See: Integrated Pest Management Strategies 2 and 4 listed below. Caused by heat on fruit during ripening and is therefore more prevalent on the sun side of the fruit. For control measures, see: Integrated Pest Management Strategies 1 and 5 listed below. 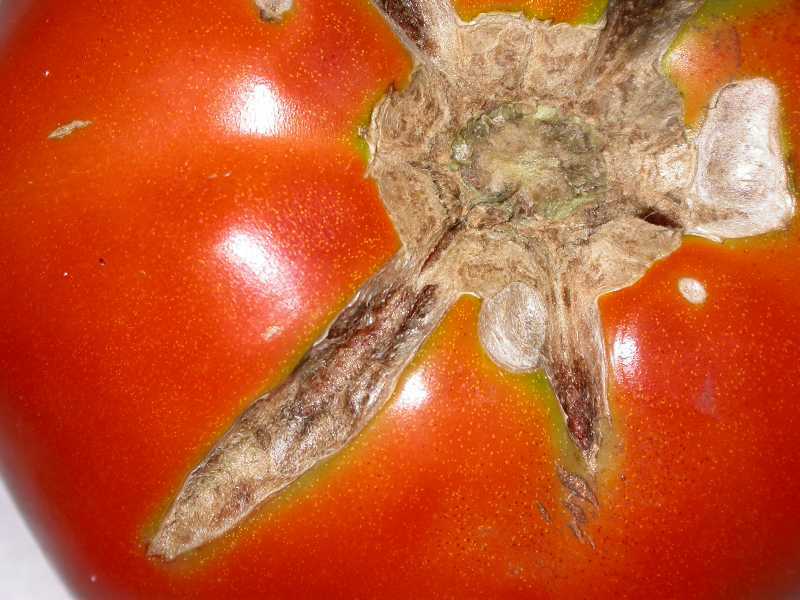 Zippering scars on a tomato are not completely understood, but may be caused by an anther from the flower sticking to the fruit as it develops possibly because of high humidity. Sometimes an open hole (locule) also develops along the zippering scar. Zippering seems to occur more frequently in cooler weather. The only control is to buy resistant varieties. For control measures, see: Integrated Pest Management Strategies 1 and 3 listed below. 1. Select resistant varieties. 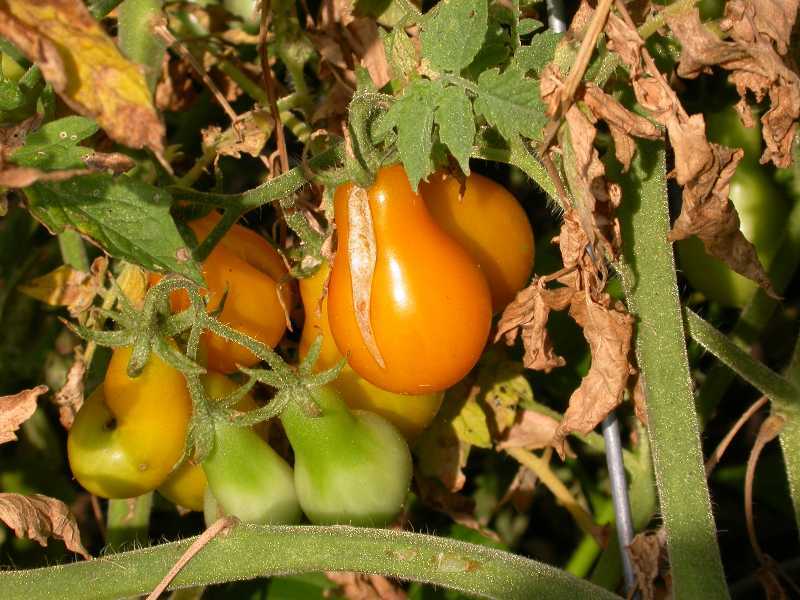 Tomato cultivars are sometimes selected for their resistance to various problems. Often this information is on the tag when buying plants or on the seed package when starting tomatoes from seed. 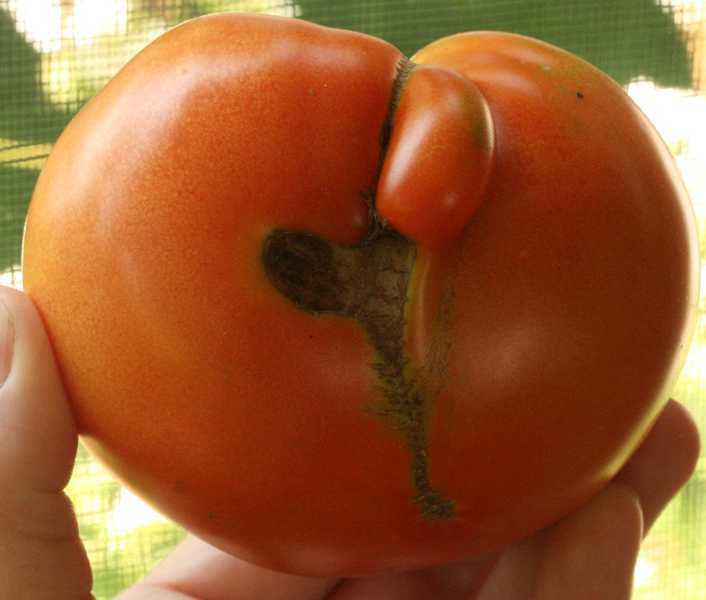 It is also found in most catalog descriptions of tomato varieties. Disease resistance is listed but also resistance to some environmental problems are included. Possible descriptions include crack resistant, zippering resistant, heat tolerant, cold tolerant, salt tolerant, humidity tolerant, adaptable to a range of soil types, no green shoulders or a combination of these. 2. Provide proper growing conditions. 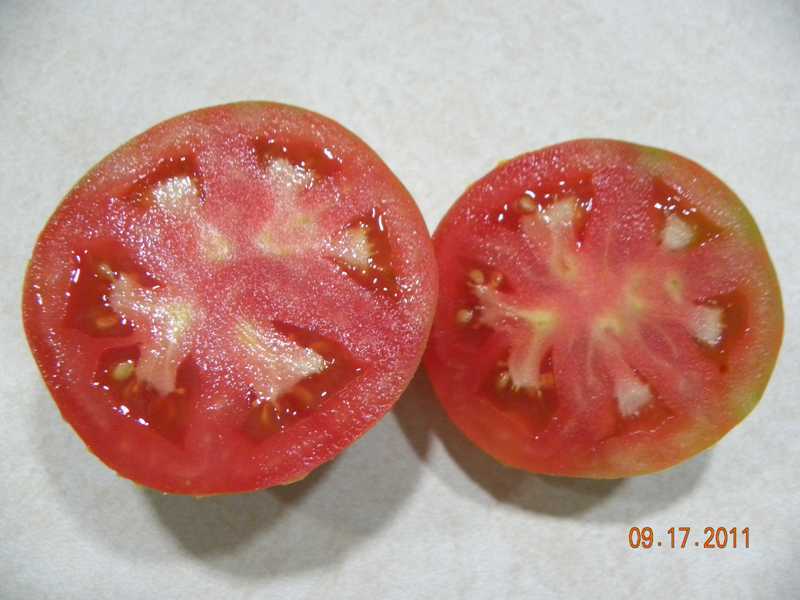 For an overall guide, see the Kemper Factsheet: Tomatoes. 3. Avoid planting outside until nighttime temperatures are consistently above 55 degrees. 4. Maintain even soil moisture. Water regularly during dry periods and mulch to help hold in soil moisture. Pile about 3 to 4 inches of mulch (straw, compost or other organic matter) around the root zone of your plants, but do NOT allow the mulch to touch the vine. Mulch placement should resemble a donut, not a volcano. 6. Avoid deep cultivation too near plants. Deep cultivation can damage roots limiting the amount of water and nutrients a plant can absorb and making the plant more susceptible to disease. 7. Modify your fertilizing practices. Use a fertilizer high in superphosphate and low in nitrogen. When adding nitrogen, use calcium nitrate rather than ammonia or urea forms. For care of tomatoes see the Kemper Factsheet: Tomatoes. 8. Avoid use of herbicides near plants. Herbicides (weed killers); such as, 2,4-D, can spread into planting beds via drift. This occurs when herbicides are sprayed on a windy day or when they volatilize into a cloud at air temperatures above 85 degrees. Damage is also possible from mulching with grass clippings from lawns that have been treated with herbicides. 9. Get a soil test. If the above methods do not correct the problem, get a soil test, which will include a test for organic matter and pH. Tomatoes prefer acidic soil (pH 6.2 to 6.8). Since soils in the St. Louis area tend to test as neutral (7.0) or above (although there are exceptions), do not apply lime or wood ash unless a pH test recommends it. Both lime and wood ash raise the soil pH; sulfur on the other hand reduces pH. 10. Plant tomatoes in a container. If all else fails, try growing tomatoes in a half-whiskey barrel sized container. 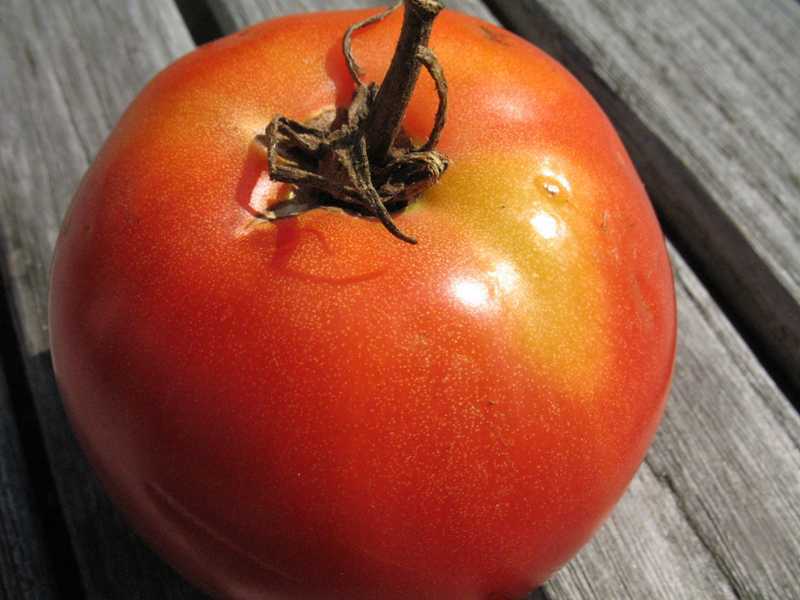 For tomatoes grown in containers, apply a fertilizer specifically formulated for tomatoes. The fertilizer must contain micronutrients including calcium. All strategies are strictly organic approaches. Organic preparations that carry the Organic Materials Review Institute (OMRI™) seal of approval are available.